The Great White Hoax, featuring acclaimed anti-racist educator and author Tim Wise, explores how American political leaders of both parties have been tapping into white anxiety, stoking white grievance, and scapegoating people of color for decades to divide and conquer working class voters and shore up political support. 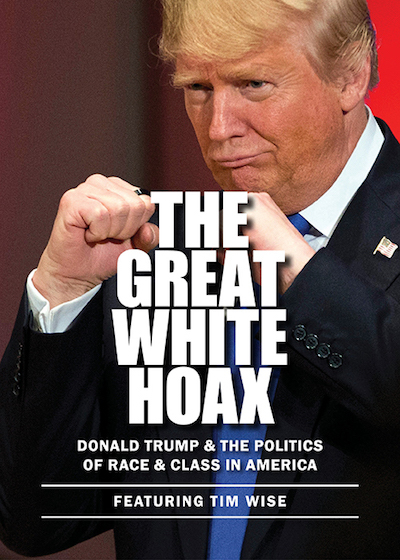 The Great White Hoax is an ideal resource for courses that look at race relations, white privilege, the intersectionality of race, class, and gender identities, presidential politics, and political propaganda. Tim Wise is among the nation’s most prominent anti-racist writers and activists. Wise is the author of White Like Me: Reflections on Race from a Privileged Son, which MEF adapted as a film in 2013. His other books include Between Barack and a Hard Place: Racism and White Denial in the Age of Obama, and, most recently, Under the Affluence: Shaming the Poor, Praising the Rich, and Sacrificing the Future of America. Wise also travels widely to lecture and provide anti-racism trainings, and appears regularly on television to offer political commentary. For more information about Tim Wise, visit TimWise.org. "It must takes courage to watch The Great White Hoax if you are classified as white. The Great White Hoax takes us on a journey into the under-reported biases that have allowed racists to claim the political future of the United States of America. Tim Wise is our guide, and he uniquely takes us on a journey in opposition to white Supremacy, patriarchy, and aggressive capitalism. Tim Wise is a change agent who is not afraid to expose the dirty laundry of “whiteness.” This film is a must see for those opposed to racism in all its forms." "My Affirmative Action Seminar at Fordham was MESMERIZED by the documentary film I showed them this morning, The Great White Hoax. At 8:30 in the morning, and on the coldest day of the year, my students sat in rapt attention as the film showed how Donald Trump's blunt appeal to white fears of losing "their" country had deep roots in US history, and that his message was not even unique among Presidential candidates. People in my class were shocked to discover that Ronald Reagan's campaign slogan was "make America great again" and to see how much Richard Nixon's "law and order" rhetoric resembled Mr. Trump's. Alongside powerful images and news clips, Tim Wise provided calm, thoughtful commentary that explained how whites throughout US history were persuaded that they had more to gain from demonizing and distancing themselves from blacks and people of color than to organize with them to challenge the owning class. I will be getting papers analyzing and critiquing the film, but my students overwhelmingly gave it the highest possible rating and want to see the last portion of it in class on Tuesday. I would recommend this unreservedly to show in college classes and in discussion groups in community organizations and religious institutions."